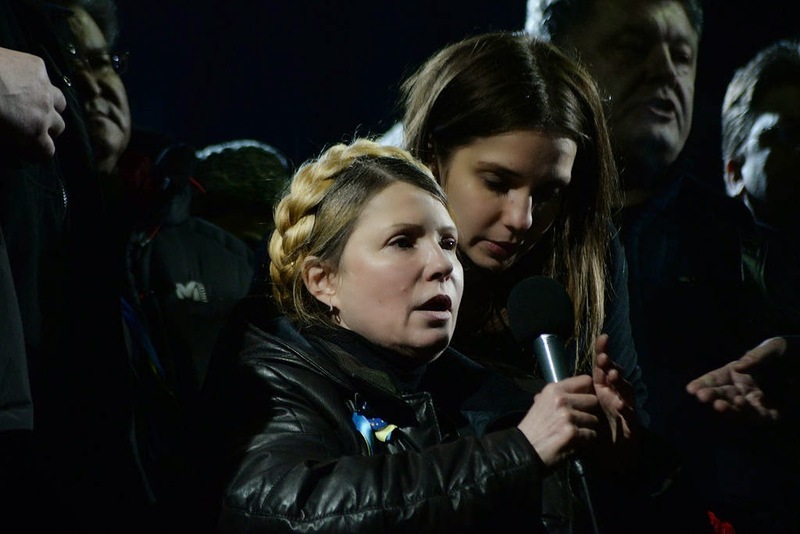 The Eloquent Woman: Famous Speech Friday: Yulia Tymoshenko's "Heroes will never die"
As events continue to unfold in Ukraine, it is helpful to examine the words of one of the revolution’s key players: Yulia Tymoshenko. On February 21st legislators voted to release former Prime Minister Yulia Tymoshenko from a prison hospital, where she was serving a seven-year sentence for abuse of power. One day later, on February 22nd, she gave the remarks below. By way of background, ten years ago, in November 2004, a rigged election gave victory to pro-Russian Viktor Yanokovych. The election campaign featured corruption, murder, the poisoning of the opposition candidate, pro-Western Viktor Yushchenko, and international concerns about the stability of Ukraine, even worries about the country’s independent future. The polling results were not accepted by millions of Ukrainians. Popular protests began a process that eventually forced a second election won by Yushchenko. The protests were a grassroots, democratic, citizen’s revolution demanding rule of law, accountability, openings to the West, and honest elections. The events became known in the media as the “Orange Revolution.” The orange scarf came to symbolize the revolution (I proudly have one hanging over my desk). Now, a decade later, a new revolution is underway. Yanokovych is again at the center of the controversy. This revolution may not be successful, although the tide of events seems to be turning favorably for the protestors. However, the future is still in doubt, especially if Russia sends in troops or the civil war breaks out. Crimea has already been annexed by Russia. 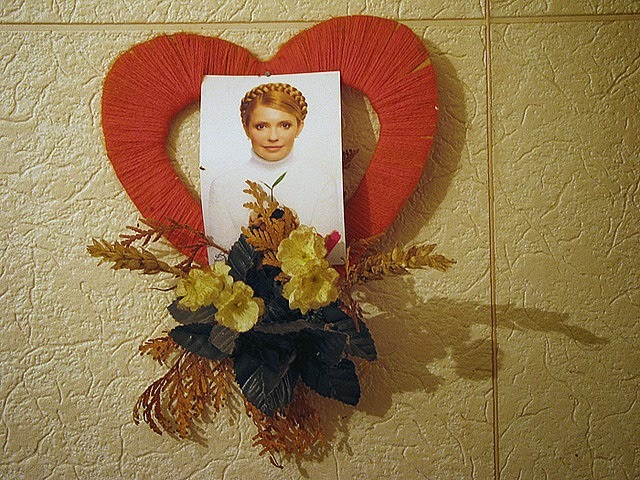 Yulia Tymoshenko has a long history in Ukrainian politics. Known to some as “Saint Yulia” because of (literally) iconic posters where her striking image is presented with religious symbolism and self-identification with western democratic principles (a famous poster has her storming the barricades as Delacroix’s “Liberty Leading the People”), she is a fascinating, yet polarizing figure. Tymoshenko is known for her braided hairstyle, stylish (often Slavic) dress, vast wealth, powerful influence, intelligence, international contacts, media savvy, and high visibility. One of the most famous images of the Orange Revolution was Tymoshenko walking up to militia riot guards and giving them flowers, an image perhaps borrowed from 1960s American protests. Her defeat by Yanukovych in the 2010 presidential election represented the victory of pro-Russian, eastern-looking politics over a pro-European Union, western view. Her subsequent imprisonment in 2011 was viewed by many (including myself) as political, particularly because her crime involved efforts to resolve a Russian-initiated energy crisis that threatened Ukraine with freezing paralysis. This is not to say that she is an angel. Tymoshenko has played rough in Ukrainian politics, often finding polarization a convenient response to the challenges facing Ukraine. She is not a saint. But she is the most visible member of the opposition leadership. With the speech below we rewind the clock by several months. Appearing on February 22nd at “Maidan Nezalezhnosti" (Independence Square) in Kyiv in a wheelchair because of health problems, Tymoshenko made a passionate speech to between 50,000-100,000 protestors. This speech could not have been more dramatic. 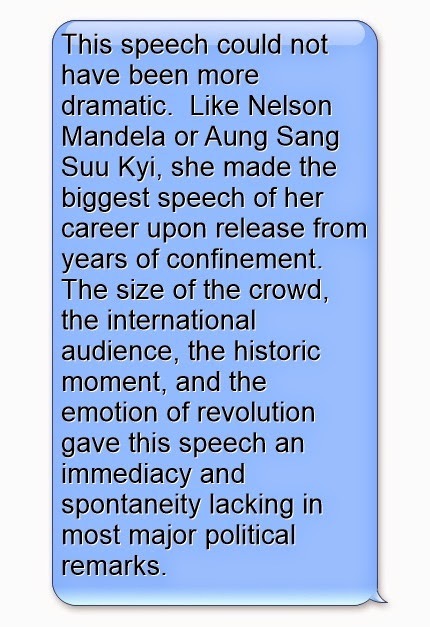 Like Nelson Mandela or Aung Sang Suu Kyi, she made the biggest speech of her career upon release from years of confinement. The size of the crowd, the international audience, the historic moment, and the emotion of revolution gave this speech an immediacy and spontaneity lacking in most major political remarks. Sadly, unlike Mandela or Suu Kyi, this speech will not be remembered as great. The speech did not influence events; it reacted to them. She did not lead the revolution; she was rescued by it. History provided a singular opportunity for greatness. This speech only offered some of the clarity, vision, inspiration, and persuasion needed at that moment. But, given the circumstances, this was a very good effort, perhaps more for its visual and emotional appeal than for content. Below her remarks are followed by political ally and former Interior Minister Yurii Lutsenko. His comments offer a condensed contrast to Tymoshenko’s. She talks to the protestors and tells them they have made history. But he names names. He seems more involved with the audience. He certainly speaks as if he knows them. His remarks are warmer, more pointed, and contextual. Tymoshenko’s words are too general. Also, he thanks Europe, Russians who crossed over to support the protesters, and the United States. This is the right approach and tone for leadership. He is not only thanking but reaching out, perhaps encouraging more partnership and support in the international community. I must add that the volatility of the situation requires measured and thoughtful responses from all of those involved, inside and outside Ukraine. If both sets of remarks could have been given by Tymoshenko, then the speech would have been really, really good. “My dears, when I came to Kyiv I could not recognize Kyiv - burnt cars, barricades, but this is free country that you have given us as a gift. When I came to Kyiv, the first thing I wanted to do was to go to Hrushevskoho Street and touch the barricades where Ukrainian boys and girls were first ready to give their lives for Ukraine. “We could put an end to this dictatorship once and for all. Remember that you are the guarantor of victory. You cannot leave Maidan before we do what we came here to do. You are the force that can guarantee that. You have earned this with your patriotism and courage. “If somebody says that now you can leave, do not believe those people. You can't leave before everything is done. “No one but you could have done that. When our guys were covering themselves with wooden shields, this is the nation and the people that cannot be put on their knees. No one will be building Mezhyhiryas again while you have to gather kopecks for sick children. You will not let that happen. “I was praying to be part of you. We have to do a few things: We have to take Yanukovych and all his goons to Maidan. If you could have changed Ukraine, you can do anything. You were not happy about the agreement with Yanukovych and it is not working now. “When I saw AutoMaidan, I saw that we cannot be defeated. Many people are afraid to come to Maidan, they are looking for your protection. Not everyone has the strength to come to Maidan and sacrifice their lives. They are scared and you are their hope. “We now have an open way to build Ukraine the way we want it. We know politicians are not trusted. Therefore we have to stand here till the end. You have deserved to run your own country. If government and parliament is composed without your participation, it will not be just. “From this time on there will be a different Ukraine. I will be a guarantor that you are not betrayed. Politics is sometimes a big theater. I will be the guarantor that it is not that way. I am asking you to forgive me for all politicians regardless of political parties, positions. Politicians of today did not deserve you. “Today we have a real victory. We have a real victory. We have put an end to the bloody dictator Yanukovych. Yanukovych was stripped of his authority in the parliament, but what was the price. A minute of silence in memory of those who died on Maidan. All politicians that will come to power in a new Ukraine have to remember that there is Nebesna Sotnya (“Heavenly Heroes”) of Maidan that will watch over them. They put down their body and soul to our freedom. Let's congratulate all the sotnyks (“leaders” or “commanders”) of Maidan. Let's say thank you to Andriy Paribiy who organized self-defense units. And thank you to Pravy Sector and its leader Dmytro Yarosh. “We have to thank all the civil organizations that have worked here on Maidan. Here a new generation of Ukraine has been born. We have to thank the priests that were praying under the bullets. We have to thank all businessmen that helped here financially. All middle class were here. A separate thank you to Kyivans (“people of Kyiv”). I won’t be wrong if I say that only in Kyiv such a revolution could have taken place. Kyiv has deserved to have a mayoral election. Mayoral elections in Kyiv will be a lesson for all politicians. A thank you for western Ukraine that has been as the forefront of the revolution. Only this UPA (Ukrainian Insurgent Army) land could have given birth to people that brought this victory. Let's thank to those Ukrainians in the east and in the south. Thank you to the press which are the heroes of Maidan. I'll be leading Be The Eloquent Woman, my day-long workshop on women and public speaking, as a pre-conference session at the European Speechwriter Network's autumn speechwriters and business communicators conference in Amsterdam. The workshop is 23 October and the conference is 24 October. You'll learn how to speak with confidence, content and credibility to subvert the common expectations of women speakers. Go here to see more details and what previous participants say. Please join me!